I love these ‘Messy Bun’ hats! Every day my hair gets tossed up and then when it is time for a hat it comes down and the ends look all messy and straggly 🙁 This hat is the answer. I chose to design mine using a hair elastic because with medium length hair my ‘bun’ is not large enough to cover a big hole at the top. The elastic is perfect because it can be stretched over the bun and then fits nice and neatly around the base of it. 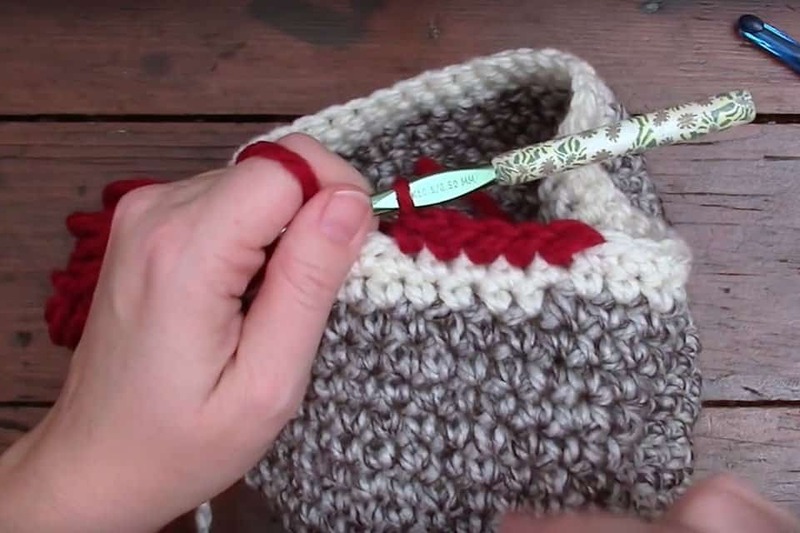 This pattern and tutorial is perfect for beginners. Use the video tutorial especially if you are just starting out. I show you step-by-step all the stitches to get this done. Once you have finished be sure to tag me on Instagram @prettydarnadorable hashtag #pdamaker I would love to see them all! *Hat is worked in continuous rounds. Do not join. 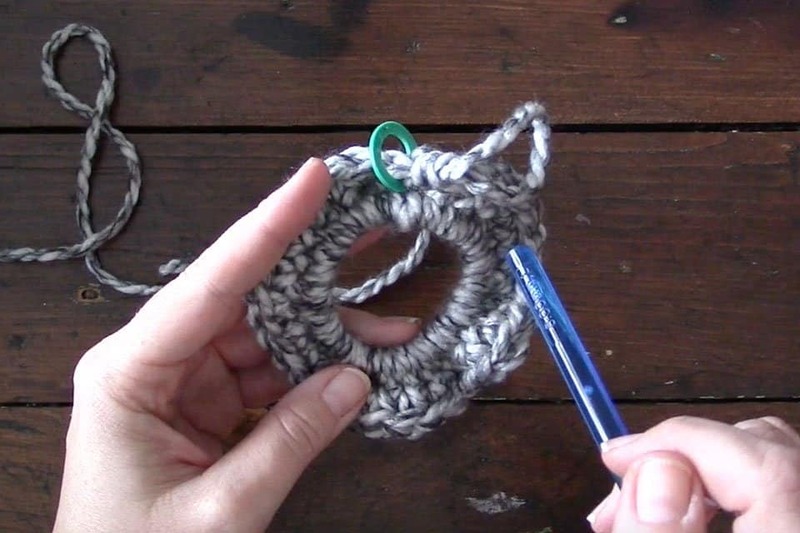 Use a stitch marker at the beginning of round for easier counting. Repeat Round 4 until hat measures 6” Note: This hat stops at mid ear – if you would like it longer just add a few more rounds before continuing to band. Change to 6.50 mm hook and cream yarn. Rnd 4: Sc in 1st and each stitch around. Fasten off and weave in ends. This is only the second pattern that I have used and I am over the top happy!! I did use a bigger yarn and hook and loved the end result. Thank you so much I am looking forward to following you and your patterns. I wish I could post a pic of the beanie, that’s how proud I am!!!! The video tutorial and the written pattern are different. In the tutorial You do an additional round of sc after the foundation round that attaches the yarn to the pony O, then start the increase in the next round, which would be round 3. Should I follow the video tutorial or go by the written pattern??? I’m enthusiastic about making this hat. The finished project looks awesome. Thanks in advance for getting back to Me. This was such an easy pattern to follow since i am just starting out. I do have one question, i only have a 5.5 mm hook right now and i am using a thinner yarn, would doubling the beginning 30 stitches on the hair tie make it bigger? I need it to fit a large adult head. I used a 5.5 with red heart worsted weight using double crochet. I did 10 rows of increase before switching to regular rows. You will want to still drop to a smaller hook for the band part. It helps the hat stay snug on the head after wear/wash. Hope this helps! Great Hat and fun to make. Although I was disappointed when I went to try it on. It was small. Would be great for a teen so this one will go to my niece! 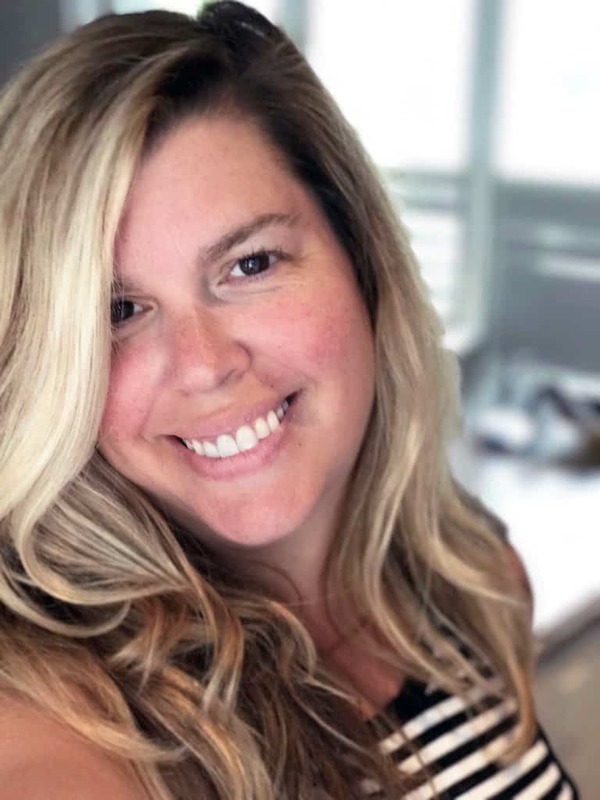 How do I make it larger for a woman with thick hair? Maybe my stitches were too tight. I would do one more increase round I’m not sure how small it was but this will give you about an extra 1.5 inches in size. I don’t have an 8mm hook, I have 6.5 and 10….I’m trying to figure out how I would need to adjust the pattern to use the 6.5. Would adding stitches to the rounds using 8mm hook work? Just finished my first hat, and it’s adorable! Thanks so much for the tutorial. My pleasure so happy you enjoyed it! Thank you for stopping by! I love this hat, the colors remind me of a sock monkey (all good I promise! :D). I’m happy to see your video tutorials, I still wouldn’t be able to crochet today if it weren’t for videos, lol. Yes me too! My mom make sock monkeys and I just love them – the colours are so classic too! 🙂 So happy you enjoyed it! Hello! I was wondering if you would be okay with me selling a hat that I made using this pattern (I wouldn’t be selling large scale, most likely no more than one). Someone I know wants me to make her one like yours, but I can’t currently justify spending time on this without getting paid for it. I would, of course, credit you. Thanks! 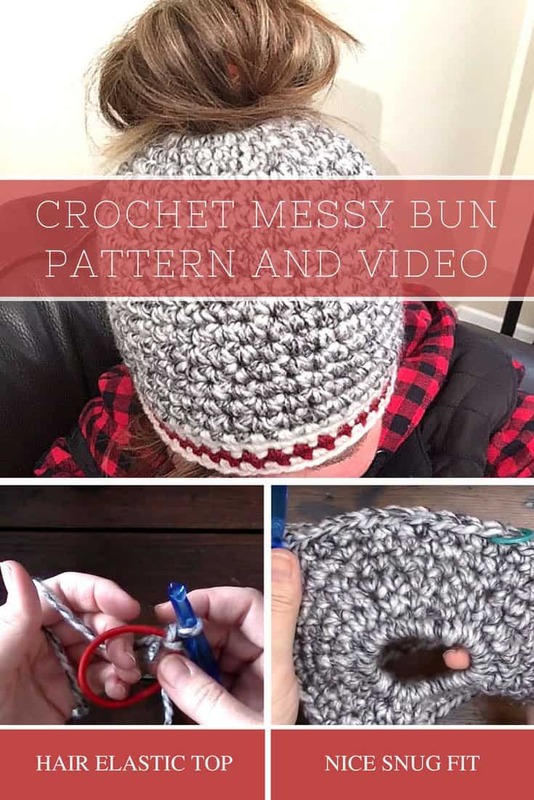 Quick and easy beginners crochet ponytail or messy bun hat pattern. Tutorial video included. I never crochet before ….what is the thickness of the yarn your using or the ply. The printed pattern and the video tutorial don’t match! The printed pattern starts the increase in the first row and the video does 2 rows on the 30 stitches before increasing on the 3rd row. What did everyone follow? Found the hat easy to make. Great instructions! I found the hat to be quite small, friends that tried it on found it to small! Not sure why! Any idea? You are awesome! I’m gonna try it! How can i do one for a baby? What an awesome video! I’m a beginner and am going to try this! Thank you for taking the time, I learn from watching….you have a great teaching voice by the way! ? Can you please tell me.what weight yarn you used? 8mm hook is large so I’m assuming bulky? I just purchased the same brand yarn she used and it is a 5 bulky weight. Great tutorial, easy to follow for a beginner like me. I was wondering how You would start for a regular hat, not a messy bun type. I love the hat but I do not have the hair for it. Thanks for sharing. Can you post a short video on how to do this? I’ve just made the messy bun hat , first crochet pattern I’ve attempted 🙂 love it but want to make it with no hole! Front post double crochet and back post double crochet. You can look up how to tutorials on Youtube! Is that the same as ‘front loop’ and ‘back loop’? See if this helps you. FPDC and BPDC are different from a front loop and back loop crochet. Thank you so much now I can see it. 😉 and understand it. Thanks for sharing your easy to follow pattern!! I love hats that are done in a spiral so that there is no ugly seam in the back. Is that how this one is done? Thank you so much for sharing your talent. I loved the tutorial very easy to follow. I look forward to seeing get more videos from you. Happy crafting! Just read that it is found at Michael’s. We do not have a Michael’s close. Can you, or anyone, suggest a comparable alternative? Yes check out http://www.yarnsub.com – it is a great site for finding equivalent yarns. If you have a Joann fabrics, the Deborah Norville Serenity Chunky is a good equivalent. Where can this yarn be found? Love the hat, but don’t know where to purchase Loops n Threads. is that supposed to be a sock monkey hat? LOVE THIS! I tried I lot of other patterns but they were so hard to understand. Your voice was so nice and clear! Where do you get the yarn from? I’ve made three hats from other patterns and they were very confusing, especially when joining. 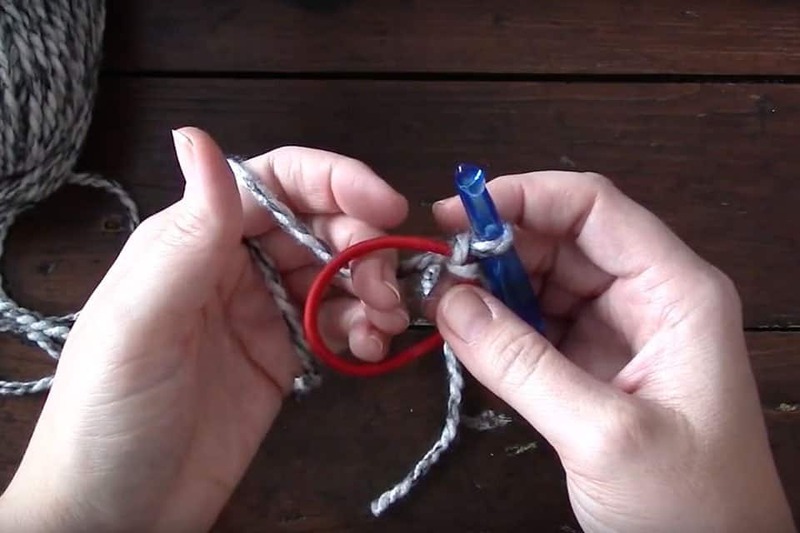 This is so much easier, just use the stitch marker. Your instructions were perfect, love listening to your soft clear voice, and your little one is a cutie! Thank you for sharing! Is it possible to print out the written instructions?? Unfortunately not 🙁 I think the best bet would be to take a screen shot and then print. 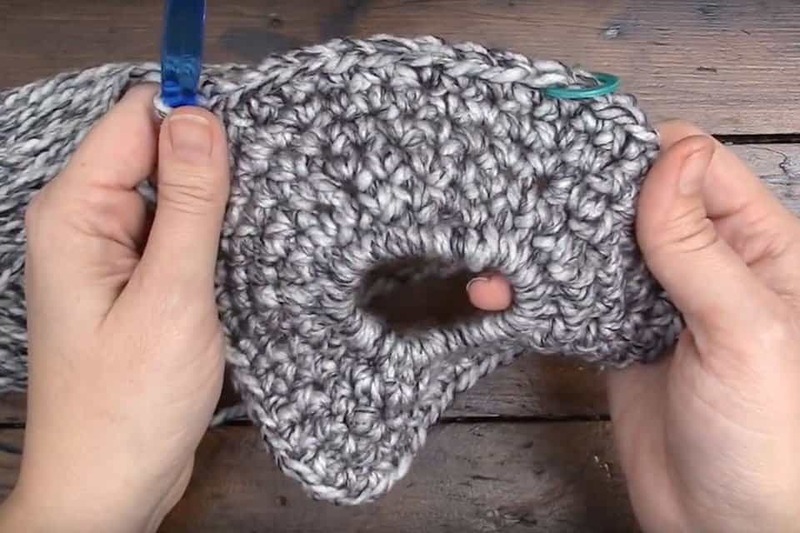 This is the best Messy Bun Hat pattern on YouTube. I can’t get the “rows” to line up…are all of your rows even? Did I miss that we were to slip stitch? only noticeble when I have changed colors. Thank you that’s exactly what I meant. I will try to do that. 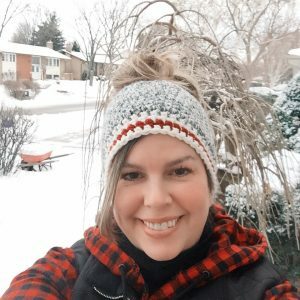 I absolutely love this pattern and the way it fits… thank you for sharing and the video tutorial really helps!!!! 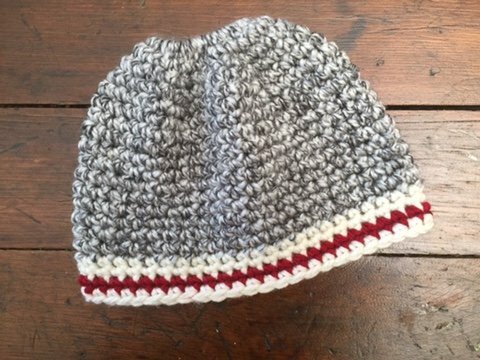 This hat is done in a spiral so it’s not going to match up. If you watch her video carefully, you will see that hers don’t match up either. But you will only notice it where you change colors. Thank you so much for sharing the directions. My three granddaughters were so excited that I will make them. Cant wait to try this!! I needed a new hobby while recovering from major surgery!! I haven’t crocheted in many yrs (25+) but this looks like a fun project!! Thanks for going into detail & keeping it simple! Try chaining 30 then join and work a sc into each and go from there. I haven’t done it before so not sure if the hole will be big enough. 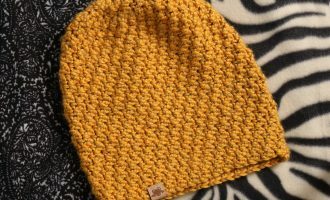 I love this hat…it’s done in bulky yarn. can it be done in DC and FPDC and BPDC for ribbing? Yes for sure! That is how originally did it but I wanted to keep it really easy for beginners ? What would the pattern portion be if we wanted to do a ribbing style for the band?